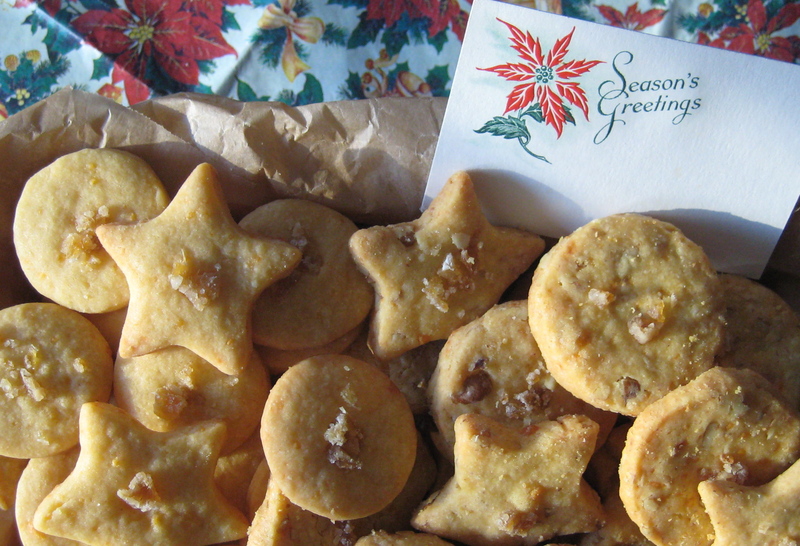 CHEESE BISCUITS SAY HAPPY HOLS AND MORE | Jane Lear. Writing on Food and Travel. I would rather labor over cassoulet for 12 than bake Christmas cookies. The very idea makes me want to run screaming out into the street. Don’t get me wrong: I greatly admire the people who carry on this tradition, willingly or under duress. I’m just not one of them. Cheese biscuits, however, are a different story. I’m using the word biscuits here in the British sense to mean crisp wafers, and it’s still common parlance in colonial cities such as Savannah, where so many Anglo traditions—culinary and otherwise—took hold and thrived. You’ll see a recipe for these cayenne-spiced nibblies (often in the form of cheese straws) in every community and Junior League cookbook published south of the Mason-Dixon Line. They’re standard fare at drinks parties, wedding receptions, and almost every other social occasion you can think of. I’m very fond of how my mother served them, with soups and stews. Perhaps this was because the store-bought bread available at the time wasn’t particularly flavorful (a baguette, for instance, was unattainable), or perhaps she wanted a change from baking-powder biscuits or cornbread, I don’t know. But cheese biscuits are a great way to add a little savory richness, some finesse, to a meal. One—just one, mind—is also a civilized way to end an evening, along with a nightcap, or what some of us call a baby-doll. I really like giving cheese biscuits as holiday presents. Even though it’s possible to buy every imaginable delicacy online these days, I think people are especially thrilled to open a gift that is homemade and almost profound in its plainness. And that is not something sweet. Down South, people appreciate cheese biscuits because they know one can never have too many. Up North, there is an element of surprise, and, once tasted, delight. “Where have these been all my life?” the recipients exclaim, reaching into the box for another. And cheese biscuits have legs, real staying power. Not only are they good keepers, but you don’t get sick to death of looking at them, the way you do Christmas cookies. Face it: By January 1, those cookies are, literally, so last year. Cheese biscuits are so simple to make that anyone, even a person who suffers from an extreme case of F.O.F (Fear of Flour), can throw them together without thinking about it. Buy the sharpest cheddar you can find, and if you are in the mood, cut it with Parmigiano-Reggiano, “for sass,” as Damon Lee Fowler explains in The Savannah Cookbook. In the photograph above, you will see two slightly different cheese biscuits. At right are the fairly sturdy ones I make most often. They stay fresh in an airtight tin for days and even improve in flavor. I usually shape the malleable dough into logs and lop off rounds, just like icebox cookies. The ones you see contain chopped pecans and a dash of Worcestershire sauce, a la Craig Claiborne. At left in the photo are thinner, smaller, more delicate wafers that will do you proud at a fancy party. For those, I rolled out the dough like a pie crust and used a couple of cutters from my husband’s stash. A very small part of his collection is on view below, along with a nice-sized chunk of frankincense. It gleams just like my go-to finishing touch for both biscuits—finely chopped crystallized ginger. If the butter is softened and the cheese is at room temperature, this dough comes together in no time flat. 1. Beat together the cheese and butter until fluffy, then beat in the salt and cayenne. Beat in the Worcestershire and pecans, if using. Then gradually add the flour, beating well to incorporate. The dough should be very malleable, like Play-Doh. 3. When needed, preheat oven to 350° and cut each log into 1/8-inch rounds, giving the log a quarter turn after each slice so it stays round. 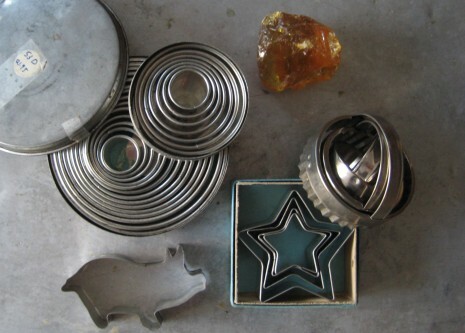 (If your rounds are a little thicker than 1/8 inch, no big deal; the biscuits will look more rustic, take longer to bake, and, obviously, you will get fewer of them.) If you have 2 dough disks, then, working with 1 at a time, roll out on a lightly floured surface with a lightly floured pin until 1/8 inch thick, about the same thickness as a pie crust. Then use your favorite biscuit or cookie cutters to cut out shapes. Gather the scraps and reroll. 4. Before baking, put a dab of crystallized ginger on top of each biscuit, pressing gently so it adheres. 5. You can either bake the biscuits, 1 baking sheet at a time, in the middle of the oven, or set the racks in the upper and lower thirds, and switch the baking sheets halfway through. Depending on the size and thickness of your biscuits, they’ll take anywhere from 16 to 18 minutes to bake. They are done when the bottoms are golden but the tops and sides are still pale. Posted: December 14th, 2011 under baking, Christmas, cookbooks, recipes. I would SO MUCH RATHER make, or munch on, cheese biscuits than Christmas cookies! These look amazing…..what a great idea to cut them with a cookie cutter!!! I’m not a baker, so if I can make these, anyone can. The dough is very malleable, thus easy to work with and very forgiving. If it gets too soft, though, just pop it back in the fridge until it firms up.